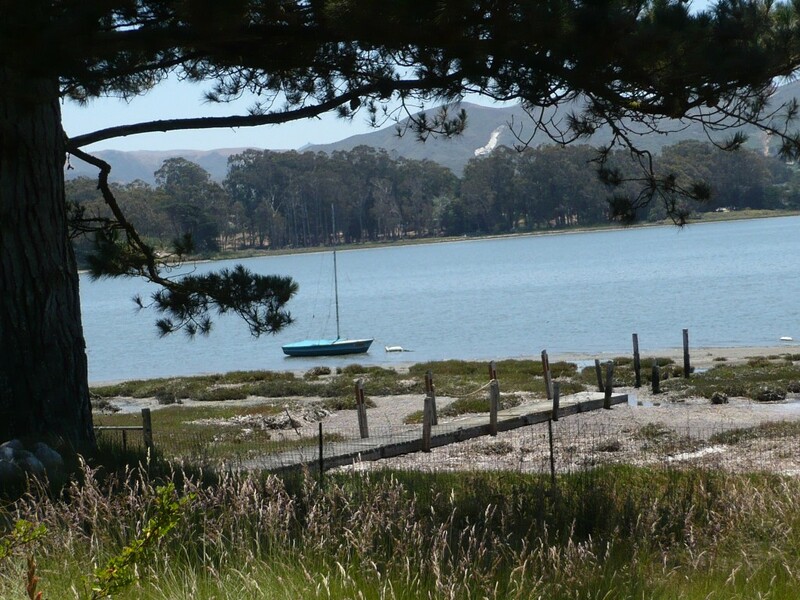 I love the California’s Central Coast and Central Valley – it is such a treat to take that curvy drive up the coastline on Highway 101 and spend a weekend in one of my favorite places – the teensy little town of Baywood. It is so full of charm! Jan and I went there for the first time about five years ago, for the wedding of our dearest friends Carla and Kevin (Another AMAZING garden wedding!). Carla’s parents opened their home and created a very memorable weekend back then, and as a result Jan and I keep on going back to this tranquil seaside hamlet, for wonderful visits with the Denker family. 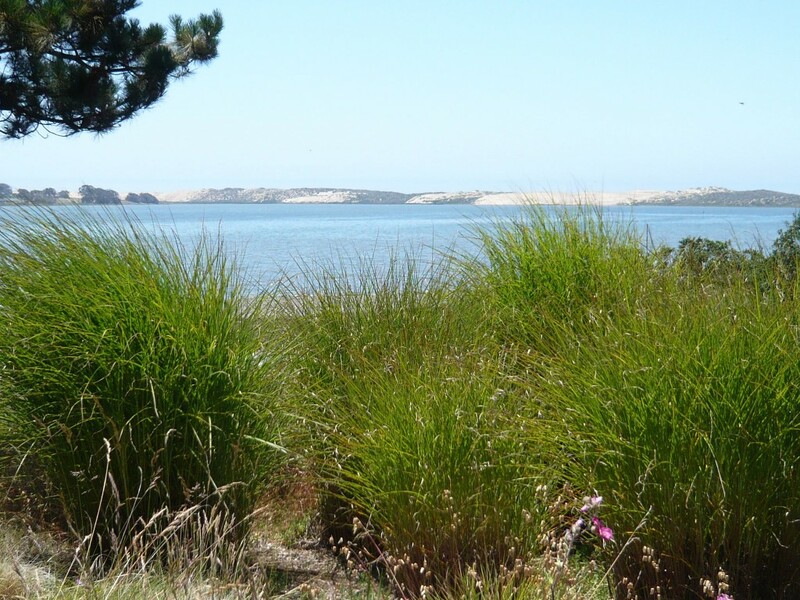 The Denkers have landscaped with grasses – they are tough and totally appropriate to the beachy, coastal vibe. 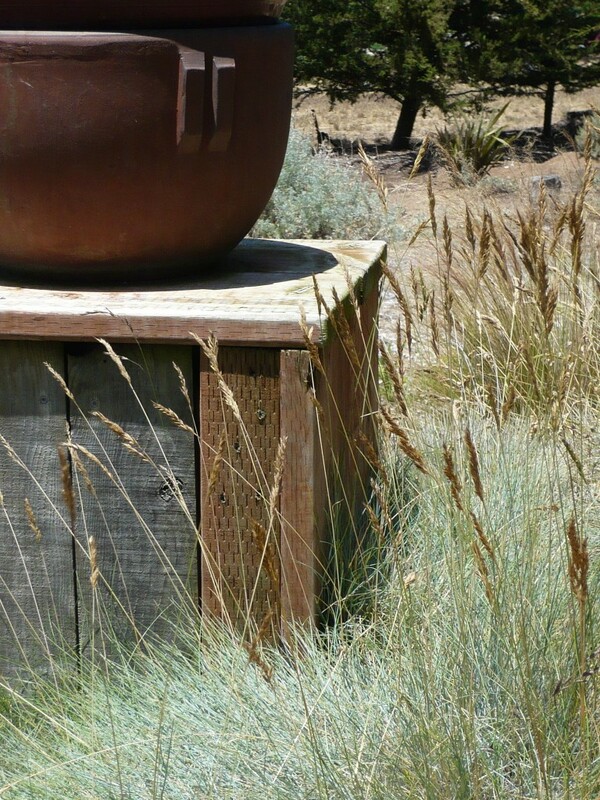 Everything moves with the slightest breeze – the briza, the festuca, the miscanthus and pennisetums are swaying and dancing to the music of the gulls and egrets. It is impossible not to unwind in a place like this – everything is … chill – like the landscape. Nothing buttoned up or ‘maintained’ within an inch of it’s life. In the landscapes I work on, there is always something hard against something soft; lots of contrast of texture – but here I am enveloped by wispy, gentle fuzziness- soft next to soft surrounded by more soft … and I love it! The weekend was too short, as usual – but the car ride back to LA takes us through Santa Barbara, and the best chorizo tacos anywhere. Thanks to the Denkers for the beauty, the food, and the many good times in their breezy, wide open seaside spaces! I love Baywood and Los Osos. 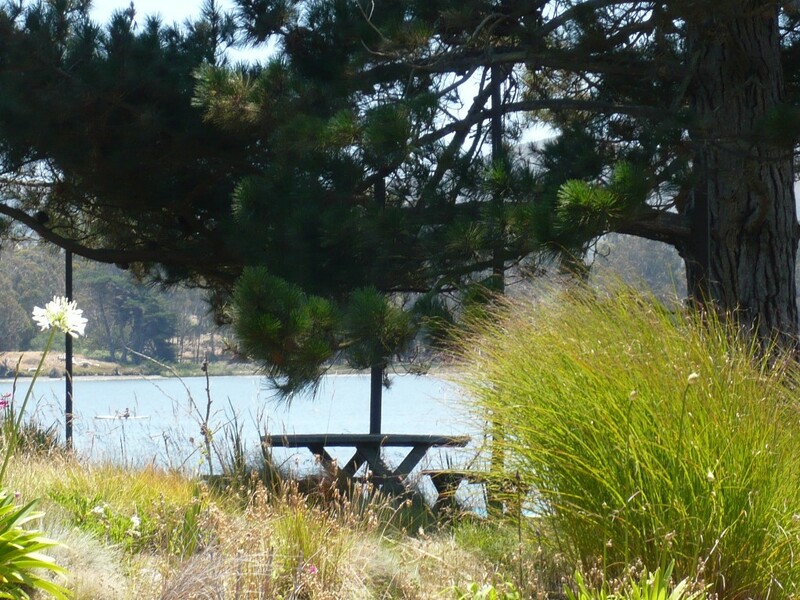 Lived in San Luis Obispo while I was in college and Baywood was always our little escape. It could be anywhere along any coast in the world. Just a little gem. Thanks for the reminder. Beautiful. We passed through Los Osos two year ago, but we didn’t know where to go or what to do. Anyway, there’s so much to see in California. I can almost feel the breeze…and a coating of sunscreen. Lovely views! One of these days before I drop off the twig, I WILL drive that winding coast road. Gorgeous photos, Germi. Wonderful getaway…recharge the batteries and remember why you married the bloke. Once again, thanx. I’m relaxed just seeing the pics and hearing about those waving grasses and the blue bay. Beautiful. Lovely, and it sounds like perfect timing for you! Funny thing looking at the pictures and reading your descriptions I could almost smell the air…thanks for taking me away from the office for a moment, I needed the break! I want a gin and tonic on that bench too? Waaaaaa! What better place to have one, with such a beautiful view! 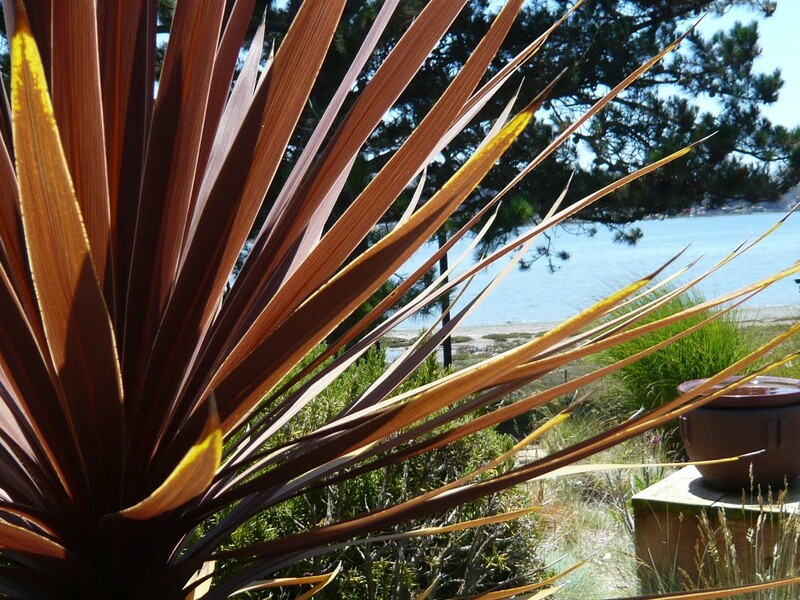 Looks like a perfect place to relax at the Denkers, and what a naturalistic planting scheme, a perfect fit for the coastal terrain, (okay, I am little ornamental grassy biasty). With my fan belting at full velocity, my misters on, my mint smelling feet in a bucket of iced water and a knotted hankerchief on my sweaty head, (as only an Englishman can tie). The only plants that catch the slightest of breezes in the furnace we call Central Texas right now, are my ornamental grasses! The delusion of a cooling breeze in their bracts, curbs, at least visually, our current, insane summer heat. The relaxing post, I needed. Hey, you Wise Guy! I wonder if you’ve ever sung karaoke at The Merrimaker in Baywood/Los Osos … I can imagine you there, in college, belting out “Born to be Wild” or “A Horse With No Name” … am I right? Am I right? It is really lovely there, isn’t it? What a perfect escape from the grind of college! You ARE wise! Chuck B., you are such a lover of California – I love it when you travel and show us small towns in CA through your eyes. This is such a special little town, but it is really a place to unwind. There isn’t much to do beyond karaoke, and then breakfast at The Sculptured Egg – which has the most delicious breakfasts, but don’t you DARE ask for ANYTHING special, or the waitress will yell at you. They only serve poached eggs, but I swear – the BEST I have ever had. Once my husband asked for ketchup and was almost thrown out. Lots of attitude, but the breakfast is worth it! And it is tremendously entertaining to look around at everyone in the small room being completely scared by this woman! Hey my new Minion! Yes, you COULD smell my sunscreen! Neutrogena 90! But the breeze was soft and the drinks were flowing and I forgot to re-apply and got a tiny flush on my decollete – shame on me! I need a parasol… but being there, well, the flush will fade, but the memories are forever! Darling Expat, keep those feet firmly on the twig! But yes, it is a breathtaking drive – as scenic as it gets; and with the right music (and the right companion, of course), it is sheer bliss! Thank YOU, for visiting and keeping me company – I look forward to it, you know! Pam! Hi! Oh, you’d LOVE it! 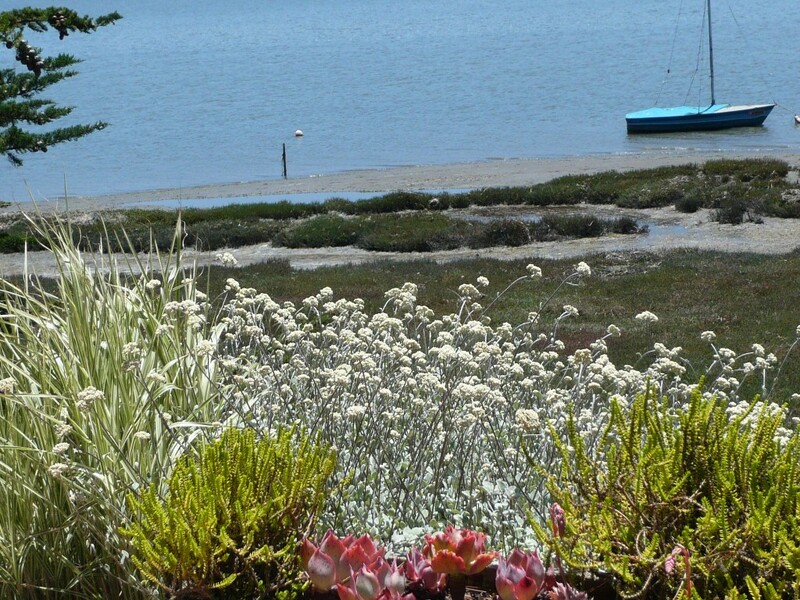 The weather is perfect – I wish you could take a break from the awful heat you’re experiencing and beam yourself to Baywood for a relaxing afternoon. A girl can dream, can’t she? Oh, you’d better believe it was perfect timing, Loree! I SO needed it! And I love that the internet can transport us from our offices and breakfast tables and studios and bring us together to share our experiences! Now THAT is magic! Big hugs! Wonderful ESP, I will be in Texas tomorrow, so while you are in Austin melting, I will be in San Antonio melting, but I’ll be wearing black and you have mint smelling feet. How do you manage that? Is that a specialty of Englishmen as well? Hmmm… nice! Through the power of my mind, I am beaming you to the Denker’s backyard seaside table, where it always an even 69 degrees with a light breeze. You can ditch the hanky on your your head and join us in drinking gin and tonics and having witty conversation about useless things. Sigh! Perfect! Enjoy! I’ll be visiting The Patch shortly!